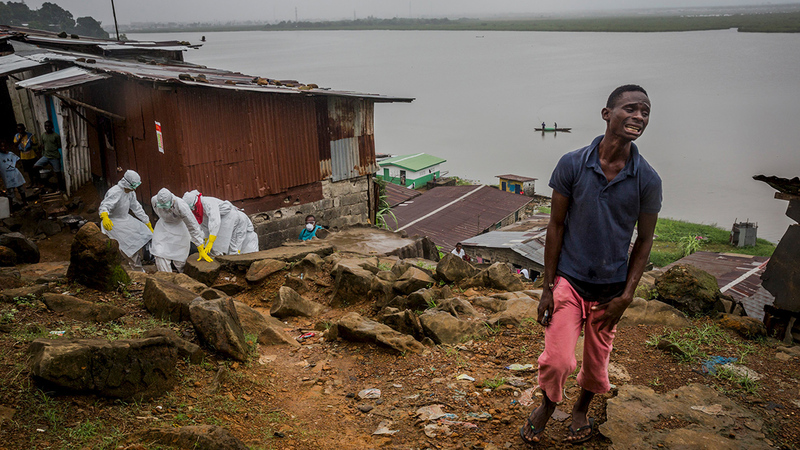 Eric Gweah, 25, grieves as he watches members of a Red Cross burial team carry the body of his father, Ofori Gweah, 62, a suspected Ebola victim, in a riverside area called Rock Spring Valley in central Monrovia, Liberia. ATTENTION EDITORS – NO SALES. NO ARCHIVES. FOR EDITORIAL USE ONLY. NOT FOR SALE FOR MARKETING OR ADVERTISING CAMPAIGNS. THIS IMAGE HAS BEEN SUPPLIED BY A THIRD PARTY. IT IS DISTRIBUTED, EXACTLY AS RECEIVED BY REUTERS, AS A SERVICE TO CLIENTS. NO COMMERCIAL USE.